Difference between revisions of "E320 Getting Started Guide"
Ensure that your kit contains all the items listed above. If any items are missing, please contact sales@ettus.com​ immediately. For Network Mode: A host computer with an 1 or 10 Gb Ethernet interface. If operating with the 10 Gb Ethernet interface, the "XG" FPGA image must be loaded before the SFP+ port will operate at 10 Gb speeds. Optionally a second 1 Gb Ethernet interface can be used to connect to the onboard ARM CPU for remote management. For Embedded Mode: A host computer is only required for initial device configuration, remote control and management, or data visualization. The host computer can connect to the RJ45 1 Gb port or Serial Console port to remotely access the Open Embedded Linux operating system running on the ARM CPU. Once configured, the USRP E320 can operate as a stand-alone device without a connection to a remote host computer. All Ettus Research products are individually tested before shipment. The USRP is guaranteed to be functional at the time it is received by the customer. Improper use or handling of the USRP can cause the device to become non-functional. Take the following precautions to prevent damage to the unit. Never allow anything especially metal objects to touch the board while it is powered on. Never allow any water or condensing moisture to come into contact with the device. Never touch the circuit board or heatsink while the device is powered on. All connections should be made/removed while is device is powered off. To use your Universal Software Radio Peripheral (USRP™), you must have the software tools correctly installed and configured on your host computer. A step-by-step guide for doing this is available at the Building and Installing the USRP Open-Source Toolchain (UHD and GNU Radio) on Linux, OS X and Windows Application Notes. It is strongly​ recommended to use the latest stable version of UHD. It is generally recommended to use the maintenance branch of the latest stable version, for example UHD-3.13. To find the latest release of UHD, see the UHD repository at https://github.com/ettusresearch/uhd. The USRP E320 requires UHD version 3.13.0.2 or later. It is recommended to use the UHD-3.13 maintenance branch at the time of this writing. NOTE: Before operating the device, it is​ ​strongly​ recommended to update to the latest version of the Embedded Linux file system on the SD card. If you are operating the device in Network Mode, the version of UHD running on the host machine and E320 USRP must match. Listed below are the interfaces to connect to the USRP E320. Each interface has specific functionality, limitations and purpose. The Serial Console provides a low-level interface to the ARM CPU and STM32 microcontroller, typically used for debugging. The serial console can also be used as a JTAG connection to the FPGA. The 1 Gb RJ45 Connection interfaces with the on-board ARM CPU. When operated in "Network mode", this interface can optionally be used for remote control and management traffic. Regardless of the operation mode (Host vs Embedded) this interface can be used to connect to the ARM via SSH. By default, the 1 Gb RJ45 connection is configured to use a DHCP assigned IP address. The SFP+ Connection supports multiple interfaces for streaming high-speed, low-latency data, depending upon which FPGA image is loaded. It is possible to gain shell access to the device using a serial terminal emulator via the Serial Console port. Most Linux, OS X, or other Unix based operating systems have a utility called screen which can be used for this purpose. Every E320 series device connected to USB will by default show up as four different devices. The devices labeled "USB_to_UART_Bridge_Controller" are the devices that offer a serial prompt. The first (with the if00 suffix) connects to the STM32 Microcontroller, whereas the second connects to the ARM CPU. If you have multiple E320 Serial Consoles connected to a single host, you may have to empirically test nodes. By default, the root user's password is left blank. Press the Enter key when prompted for a password. Using the default configuration, the serial console will show all kernel log messages (which are not available when using SSH) and give access to the boot loader (U-boot prompt). This can be used to debug kernel or boot-loader issues more efficiently than when logged in via SSH. Using the Serial Console interface, it is possible to connect to the STM32 microcontroller with the command below. The STM32 controls the power sequencing and several other low-level device operations. The STM32 interface provides a very simple prompt. The command help will list all available commands. A direct connection to the microcontroller can be used to hard-reset the device without physically accessing it (i.e., emulating a power button press) and other low-level diagnostics. By default, the RJ45 1 Gb management interface is configured to be assigned a DHCP IP address. If you have access to a network which provides a DHCP server (such as a common router's LAN), attach the RJ45 1 Gb port to this network. Details vary by vendor, however, most router management interfaces will provide a list of attached devices to the LAN including their IP address. NOTE: Modify the value <ETHERNET_ADAPTER_NAME> to match the interface you would like to create a DHCP server on. NOTE: The IP address may vary depending on your network setup. NOTE: The root password is empty/blank. On Microsoft Windows, the SSH connection can be established using the third-party program, such as ​PuTTY. Before operating the device, it is​ ​strongly​ recommended to update to the latest version of the Embedded Linux file system. If you are operating the device in Network Mode, the version of UHD running on the host machine and E320 USRP must match. 2. Physically remove microSD card from device and write a new file system to the microSD card. The SD Card is divided into four partitions. There is two root file system partitions, a boot partition and a data partition. Any data you would like to preserve through Mender updates should be saved to the data partition, which is mounted at /data. Mender is third-party software that enables remote updating of the root file system without physically accessing the device (see also the Mender website https://mender.io). Mender can be executed locally on the device, or a Mender server can be set up which can be used to remotely update an arbitrary number of USRP devices. Users can host their own local Mender server, or use servers hosted by Mender as a paid service; contact Mender for more information. When updating the file system using Mender, the tool will overwrite the root file system partition that is not currently mounted. Any data stored in the root partitions will be permanently lost with a Mender update. After updating a partition with Mender, it will reboot into the newly updated partition. Only if the update is confirmed by the user, the update will be made permanent. This means that if an update fails, the device will be always able to reboot into the partition from which the update was originally launched, which presumably is in a working state. Another update can be launched now to correct the previous, failed update, until it works. NOTE: In the output of the command, the folder destination where the images are saved is printed out. Next, you will need to copy this Mender file system image to the USRP E320. This can be done with the Linux utility scp. Note: The path and IP may different for your configuration, the command above assumes you're using the default installation path of /usr/local and that the E320's IP is 192.168.1.51. After copying the Mender file system image to the E320, connect to the E320 using either the Serial Console, or via SSH to gain shell access. If you are using a Mender server, the updates can be initiated from a web dashboard. From there, you can start the updates without having to log into the device, and you can update groups of USRPs with a few clicks in a web GUI. The dashboard can also be used to inspect the state of USRPs. This is a simple way to update groups of rack-mounted USRPs with custom file systems. For more information on updating the file-system, refer to the UHD Manual at ​http://uhd.ettus.com. The microSD card is accessible directly on the Board-only version of the E320 USRP. The E320 Full Enclosure versions must be opened with the included Torx wrench. NOTE: This will overwrite all data saved on the microSD card, including any data saved to the /data parition. [INFO] No inventory file found at /usr/local/share/uhd/images/inventory.json. Creating an empty one. Insert the microSD card into the host computer. NOTE: In this specific example configuration, the SD card has been attached to sdb. WARNING: The Linux utility dd can cause unrecoverable data loss if the incorrect disk is selected, or if the parameters are input incorrectly. Ensure you have selected the correct input and output parameters for your system configuration. NOTE: You must use a 16 Gb or larger SD card. The ​<SD_CARD_DEV_NAME>​ device node depends on your operating system and which other devices are plugged in. Typical values are ​sdb​ or mmcblk0​. This step of writing the disk image to the SD card can take several minutes to complete. You can now remove the microSD card from your host computer and insert it into the USRP E320. The Linux utility bmaptool can be used in place of the utility dd, and will generally write the SD card image faster, however it is not a standard Linux utility and must be installed on your host system. For details on configuration please refer to the systemd-networkd manual pages. The FPGA image should match the version of UHD installed on the host computer when operated in Network mode. Network mode FPGA image updates must be made through the RJ45 management interface. In this example, we load the XG variant of the FPGA image. [INFO] [MPMD] Claimed device without full initialization. [INFO] [MPMD IMAGE LOADER] Starting update. This may take a while. [INFO] [MPM.RPCServer] Resetting peripheral manager. [INFO] [MPMD IMAGE LOADER] Update component function succeeded. [INFO] [MPM.PeriphManager] Found 1 daughterboard(s). The FPGA is immediately updated, and this FPGA image will continue to be used. The device does not need to be power cycled to use the new image. To load a different FPGA image (i.e. 1G), modify the device argument fpga= to a value of fpga=1G. To specify the path to a custom FPGA image, use the ​--fpga-path​ argument. The Verilog code for the FPGA in the USRP E320 is open-source, and users are free to modify and customize it for their needs. However, certain modifications may result in either bricking the device, or even in physical damage to the unit. Please note that modifications to the FPGA are made at the risk of the user, and may not be covered by the warranty of the device. It is possible to update the FPGA image when operated in Embedded mode. Connect to the ARM CPU via Serial Console or via SSH. It is generally recommend to use SSH over the RJ45 interface for remote management. NOTE: The 1 Gb RJ45 management interface will require Internet access for this next step. [INFO] No inventory file found at /usr/share/uhd/images/inventory.json. Creating an empty one. NOTE: The default UHD FPGA Images destination within the E320's file-system is /usr/share/uhd/images. The default UHD FPGA Images destination on a typical host installation is /usr/local/share/uhd/images. [INFO] [MPM.PeriphManager.UDP] No CHDR interfaces found! For more information on updating the FPGA image, refer to the UHD Manual at http://uhd.ettus.com. The device supports multiple high-speed, low-latency interfaces on the SFP+ port for streaming samples to the host computer. Complete the steps below to set up a streaming connection over the 1 Gb Ethernet interface on the SFP+ Port. 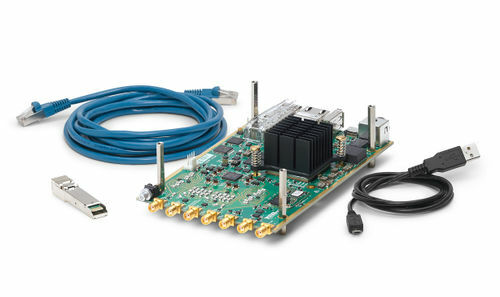 NOTE: The 1G FPGA image must be loaded for the SFP+ Port to operate at 1 Gb speeds. If the XG image is loaded, the port will be unresponsive at 1Gb speeds. 1. Configure your Host's 1 Gb Ethernet interface as shown below. This interface should be separate from the 1 Gb NIC/network which is connected to the 1 Gb RJ45 management interface. NOTE: When operating the SFP+ Port at 1 Gb speeds, it is important to set a MTU of 1500 and not a value of automatic. Mismatched MTU values on either the Host or E320 may cause flow control errors. Your computer may need to be restarted for the MTU value to take effect. 2. Insert the RJ45-to-SFP+ adapter ​into the​ SFP+ Port​. 3. Connect the SFP+ adapter on the device to an Ethernet port on the host computer using a standard Ethernet cable. The ​ Green LED​ above the ​SFP+ Port​ should illuminate. Press CTRL+C to stop the ping program. 5. Verify your MTU is set correctly for 1 Gb speeds on the E320. See the section Updating the Network Configurations for additional details. Proceed to the next section Verifying Device Operation. Load the XG FPGA image for 10 Gb streaming as detailed in the section Updating the FPGA Image. You will need to use a 10 GigE cable that can be plugged in directly to the SFP+ connector on the board. NOTE: The XG FPGA image must be loaded for the SFP+ Port to operate at 10 Gb speeds. If the 1G image is loaded, the port will be unresponsive at 10 Gb speeds. Mismatched MTU values on either the Host or E320 may cause flow control errors. 1. Configure your Host's 10 Gb Ethernet interface as shown below. NOTE: When operating the SFP+ Port at 10 Gb speeds, it is important to set a MTU of 8000 and not a value of automatic. Mismatched MTU values on either the Host or E320 may cause flow control errors. Your computer may need to be restarted for the MTU value to take effect. 2. Connect the SFP+ port on the device to an Ethernet port on the host computer using a 10 Gb SFP+ copper or fiber cable. 5. Verify your MTU is set correctly for 10 Gb speeds on the E320. See the section Updating the Network Configurations for additional details. Once you have successfully setup a management interface and streaming interface, you can now verify the devices operation using the include UHD utilities. The USRP E320 contains 2 channels, each represented on the front panel as RF A and RF B. Below is the subdev mapping of RF Ports. The USRP E320 supports master clock rate from 200 kHz to 61.44 MHz and can be changed by adding master_clock_rate=<rate> to the default UHD args. The default master clock rate is 16 MHz. Sample rates as delivered to/from the host computer for USRP devices are constrained to follow several important rules. It is important to understand that strictly-integer decimation and interpolation are used within USRP hardware to meet the requested sample rate requirements of the application at hand. That means that the desired sample rate must meet the requirement that master-clock-rate/desired-sample-rate be an integer ratio. Further, it is strongly desirable for that ratio to be even. This ratio is the decimation (down-conversion) or interpolation (up-conversion) factor. The decimation or interpolation factor may be between 1 and 1024. There are further constraints on the decimation or interpolation factor. If the decimation or interpolation factor exceeds 128, then it must be evenly divisible by 2. If the decimation or interpolation factor exceeds 256, then it must be evenly divisible by 4. The UHD utility uhd_usrp_probe provides detailed information of the USRP device. [INFO] [MPM.PeriphManager] init() called with device args `product=e320,mgmt_addr=192.168.10.2'. You can quickly verify the operation of your USRP E320 by running the rx_ascii_art_dft UHD example program. The rx_ascii_art_dft utility is a simple console ­based, real-time FFT display tool. It is not graphical in nature, so it can be easily run over an SSH connection within a terminal window, and does not need any graphical capability, such as X Windows, to be installed. It can also be run over a serial console connection, although this is not recommended, as the formatting may not render correctly. 1. Attach an antenna to the RF A / RX2­ antenna port of the E320. NOTE: Modify the command­line argument freq ​above to specify a tuning frequency for a strong local FM radio station. You will also need to update the IP Address to match your device IP. 3. You should see a real-time FFT display of 2 MHz of spectrum, centered at the specified tuning frequency. 4. Type "Q" to stop the program and to return to the Linux command line. 5. You can run with the ​­­--help ​argument to see a description of all available command-line options. $ ./rx_ascii_art_dft --args "addr=192.168.10.2" --freq 98.5e6 --rate 2e6 --gain 40 --ref-lvl="-30" --dyn-rng 90 --ant "RX2" --subdev "A:0"
Included with the UHD driver example programs is a utility, benchmark_rate to benchmark the transport link of the system. A system's maximum performance is dependent upon many factors. benchmark_rate will exercise the transport link and CPU of the system. NOTE: This example requires the 1G FPGA image to be loaded. When streaming samples over a 1 Gb transport link, the maximum accumulative rate for all channels is 25 MS/s with a sc16 OTW format. To achieve higher streaming rates, it is recommended to use the 10 Gb interfaces. NOTE: These examples require the XG FPGA image to be loaded. The default user is root and the password is empty (no password). In some streaming modes, the Intel I219-LM NIC can produce flow control and sequence errors. It is recommended to use a USB3 to 1 Gb Ethernet Adapter for hosts which have an I219-LM NIC. NOTE: This USRP product is a piece of test equipment.